Are you one of the coffee lovers who want to take their coffee experience to the next level? Well, the equipment that you need to invest in is a coffee grinder. You might worry about the additional charge in your power consumption, but fortunately, coffee grinders also come in manual mechanisms. One of which is the Dibek Manual Coffee Grinder. As a manual grinder, it doesn’t require batteries, cords, or electricity to work. But, it has adjustable settings, which allow you to grind beans to your preferred coarseness. The best feature of Dibek Manual Coffee Grinder is its convenience and ease of use. Rotating the blades manually is easy and holding the grinder’s body is comfortable. Its inexpensive cost also doesn’t compromise quality and performance. The housing of the Dibek grinder is made of stainless-steel material that does not rust or break easily. Compared to high-end grinders, this mid-range priced grinder is crafted with a ceramic combo burr grinder. This quality is the same as the traditional German cookware that can last up to five times longer than stainless-steel blades. The quality is not just a mere advertisement; tests against other grinders back it. Additionally, the other components are made of high-grade polyamide nylon 6 and ceramic materials to improve strength and quality. Its aerodynamic design can grind coffee beans 25% faster than the earlier versions of burr grinders. The Dibek Manual Coffee Grinder has dimensions of 10.1 by 8.4 by 6.7 inches and weight of about 10.4 ounces. This compact and lightweight construction makes it easy to transport and carry anywhere you go. In fact, it can easily fit inside the bag. What is better is that its parts can be detached. Coffee lovers can take it on camping, hiking, and other outdoor activities. The ergonomic design of the Dibek Manual Coffee Grinder makes it easy to hold and use. Since the parts are removable, it is easy to clean too. More importantly, the detachable hand crank operates with minimal noise that is almost 90% lesser than traditional electric grinders. No more disturbing the entire household or office when making your favorite cup of coffee. The Dibek Manual Coffee Grinder is also equipped with 18 adjustable settings. It allows you to set the level of coarseness of your coffee beans. It gives you full control over which type of brew you want. With this grinder, you can enjoy various brews such as French press, percolator, cold brew, and pour over. You can also use it for grinding spices and herbs. The Dibek Manual Coffee Grinder can grind coffee beans that can yield up to two to three cups of coffee. No more wastes of coffee beans as it can grind just the right amount for you or your buddy. This small capacity also supports the portability and ease of use. To assist first-time coffee brewers, the Dibek Manual Coffee Grinder comes with a detailed guide. It contains comprehensive details on how to use the grinder for any brew methods or coffee bean brands. As such, the Dibek grinder is easy to assemble. Another bonus feature that other grinders do not have is the cut-resistant gloves. This item protects you from potential hazards and makes it easier for you to disassemble and wash the grinder’s components. 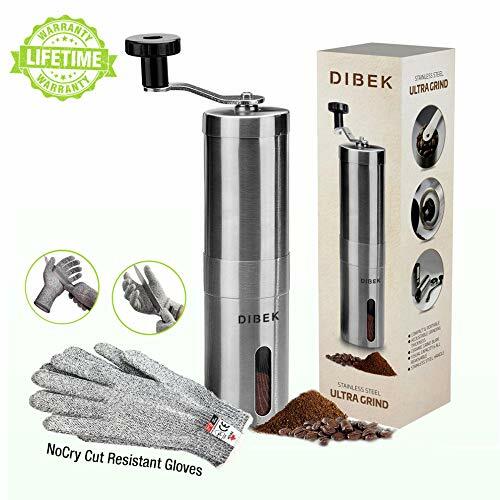 The Dibek Manual Coffee Grinder is made of a stainless-steel body and has ceramic burr blades that make it long-lasting. It is both compact and lightweight, so you can easily bring it anywhere conveniently as well as store it in your kitchen cabinet. This multi-functional grinder is not only useful for coffee beans but can also be used for spices and herbs. What is better is that it operates silently and using it is not as difficult as other manual coffee grinders. Additionally, you can clean it easily as the parts are removable. While the Dibek Manual Coffee Grinder is a high-quality, practical manual grinder, it may not be every coffee lover’s best choice. Some users might be looking for more convenience. The Triple Tree Manual Coffee Grinder is a good alternative. Its features are almost the same as the Dibek Manual Coffee Grinder but with slight differences in design and price. The Triple Tree Manual Coffee Grinder comes in two clear jars where the ground coffee beans come out as they are ground on the top burr blades. The other jar can be used to store coffee beans. Each jar has a capacity of up to 5.5 ounces that can yield one to cups of coffee. The parts such as the handle and lid are detachable and easy to clean. The nut control is adjustable which gives you control on how fine or coarse the ground beans will be. Like the Dibek Manual Coffee Grinder, it can be easily transported to places. The Triple Tree Manual Coffee Grinder is also a good choice but requires careful use as the jars can break. Also, it is more expensive than the Dibek Manual Coffee Grinder. While coffee grinders can be quite expensive and considered as a luxury, it is a good investment in the long run. Thus, when you buy a coffee grinder, make sure it is high quality and can last for years. The Dibek Manual Coffee Grinder is an example of a premium coffee grinder. Its stainless steel body and ceramic blades make it one of the most durable manual grinders in the market today. Its adjustable setting gives you full control over which kind of coffee grounds you need for the specific brew method such as French press, drip, and cold brew. For a mid-range manual coffee grinder, the Dibek Manual Coffee Grinder is worth the money. Without any fuss or special set-up required, it is convenient and easy to use. No wonder it makes it to the top-selling list of manual grinders today!